Will you sign our petition calling on the Sri Lankan High Commission to hold ATG Ceylon accountable over their long list of workers’ rights violations? In Sri Lanka, one of the world’s biggest clothing and garment producers, many workers are found in factories located in fenced off free trade zones across the country. The ongoing work of War on Want’s partner, Free Trade Zones & General Services Employees Union (FTZ&GSEU) has been vital in raising awareness of workers’ rights, enabling them to come together and fight for better working conditions.Thanks to training, workers are now refusing to accept unsafe working conditions or abuse by their bosses. 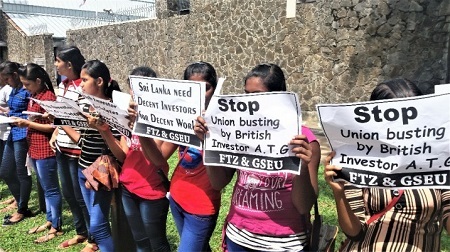 Now we are asking our supporters to take urgent action in solidarity with members of FTZ&GSEU as they face intimidation, harassment, and unfair dismissals from bosses at industrial glove manufacturing company ATG Ceylon. Thousands of you already wrote to John Taylor, the company Chair of ATG Ceylon and a British national, and told him to end the toxic culture of harassment and discrimination against ATG employees who are Union members. They are still refusing to engage with the union, so we are ramping up the pressure and writing to the Sri Lankan government. Will you add your name?